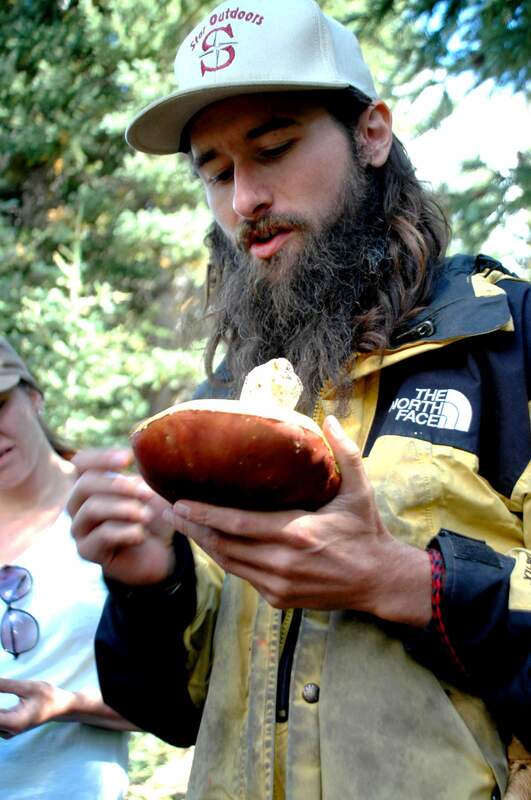 Local mycologist Chris Ricci, of Majesty Mushrooms, examines boletus edulis, better known as a king bolete mushroom, found Sunday in San Juan National Forest north of Durango. During his guided mushroom foray, about 30 people searched for fungi, and several found varieties they were excited to take home and eat. 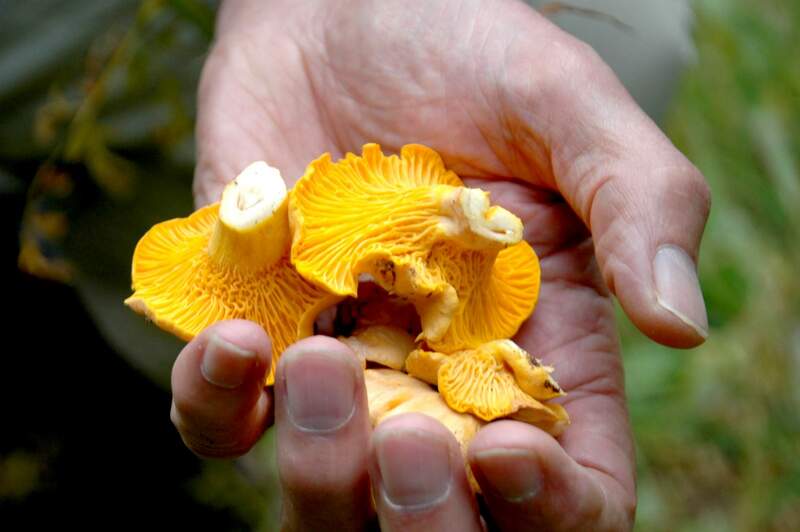 Ron Campbell of Houston was elated to find these Rocky Mountain chanterelle mushrooms. Among the most popular of mushrooms for eating, chanterelles are just one of the 14 edible varieties found in the forests of Southwest Colorado. PURGATORY AT DURANGO MOUNTAIN RESORT – Several people found puffballs, or maybe some artist’s conks – but the lucky ones found enormous hawks wings, highly prized king boletes or the ever-coveted Rocky Mountain chanterelles. They proudly showed off their take, and put them in their baskets. About 30 mushroom lovers gathered Sunday at the top of Purgatory at Durango Mountain Resort in the San Juan National Forest to follow the lead of locally renowned mycology authority Chris Ricci of Majesty Mushrooms. Ricci, who said he fell in love with mushrooms through his mother’s cooking, has spent his life studying the varieties growing in forests across the nation. “It helped to live in some of the mushroom hot spots of North America, like the Smoky Mountains, or Appalachia, or the Pacific Northwest,” he said, while casually strolling through gladed Colorado forests under thundering a sky at 9,000 feet. Ricci began studying mycology in his youth, bringing home specimens to identify. While gatherers dispersed slowly into the woods, baskets in hand, a steady stream would rush back to him with their finds, asking what this was or that, if it’s edible or not. To anyone interested, he unleashed an encyclopedic wealth of information. Surrounded by tall spruce and fur and standing on a carpet of lush undergrowth, Ricci explained the role of the much-overlooked fungus. Sarah Wright, a self-described jack-of-all-trades with Durango Natural Foods Co-op who puts on the series of educational walks and talks from alternative health care to homemade condiments, said people return for Ricci’s hunts. Most were hopeful for a few handfuls of chanterelles, and many were rewarded. The king boletes, sizable dark orange dense things, also called porcinis, were carried out by a few happy hunters. Ingrid Lincoln, of Mancos, said she couldn’t wait to sauté hers with oil and onions. Ricci called them the little pork steaks of the forest. Not only do many find mushrooms tasty, they see other benefits. Some studies show eating mushrooms can reduce growth of cancer cells. While toadstools seem to hide in plain sight, edible or not, Ricci’s fascination with them is easy to find. A member of the group approached him with an exotically odd, colorful specimen. He said the reindeer had ceremonial purposes but knows they aren’t good eating. The Rocky Mountains hold at least 14 varieties, however, that are.